Resource limits are invisible, so most people don’t realize that we could possibility be approaching them. In fact, my analysis indicates resource limits are really financial limits, and in fact, we seem to be approaching those limits right now. Many analysts discussing resource limits are talking about a very different concern than I am talking about. Many from the “peak oil” community say that what we should worry about is a decline in world oil supply. In my view, the danger is quite different: The real danger is financial collapse, coming much earlier than a decline in oil supply. This collapse is related to high oil price, and also to higher costs for other resources as we approach limits (for example, desalination of water where water supply is a problem, and higher natural gas prices in much of the world). The financial collapse is related to Energy Return on Energy Invested (EROEI) that is already too low. I don’t see any particular EROEI target as being a threshold–the calculations for individual energy sources are not on a system-wide basis, so are not always helpful. The issue is not precisely low EROEI. Instead, the issue is the loss of cheap fossil fuel energy to subsidize the rest of society. If an energy source, such as oil back when the cost was $20 or $30 barrel, can produce a large amount of energy in the form it is needed with low inputs, it is likely to be a very profitable endeavor. Governments can tax it heavily (with severance taxes, royalties, rental for drilling rights, and other fees that are not necessarily called taxes). In many oil exporting countries, these oil-based revenues provide a large share of government revenues. The availability of cheap energy also allows inexpensive roads, bridges, pipelines, and schools to be built. As we move to energy that requires more expensive inputs for extraction (such as the current $90+ barrel oil), these benefits are lost. The cost of roads, bridges, and pipelines escalates. It is this loss of a subsidy from cheap fossil fuels that is significant part of what moves us toward financial collapse. Renewable energy generally does not solve this problem. In fact, it can exacerbate the problem, because the cost of its inputs tend to be high and very “front-ended,” leading to a need for subsidies. What is really needed is a way to replace lost tax revenue, and a way to bring down the high cost of new bridges and roads–that is a way to get back to the cost structure we had when oil (and other fossil fuels) could be extracted cheaply. When a company decides to extract a resource such as oil, gold, or fresh water, it looks for the least expensive source available. After many years of extraction, the least expensive sources become depleted, and the company must move on to more expensive resources. It always looks like there are plenty of resources left; they are just increasingly expensive to extract. Eventually an extraction limit is reached; this limit is a price limit. As easy to extract resources become more depleted, it becomes necessary to invest more resources of every type in extraction (for example, manpower, oil, natural gas, fresh water), in order to extract a similar amount of the resource. I have called this the Investment Sinkhole problem. The need to use greater resources in the process of resource extraction leaves fewer resources available for other purposes. Prices adjust to reflect this out of balance. If there is no substitute available for the resource that is reaching limits, the economy adjusts by contracting to match the amount of resource that is available at an affordable price. Some economists might call the situation “reduced demand at high price”. What the situation looks like, in terms most of us are used to using, is recession or depression. Part of the confusion is that many people completely miss the fact that there is a close connection between cheap energy supply of the exact type needed (for example, gasoline for cars, diesel for trucks, electricity for many factory applications) and the ability of the world economy to make goods and services. If the price of energy of the type a particular manufacturer or service provider uses increases (say gasoline or diesel or natural gas or electricity), that manufacturer or service provider in the short term has no choice but to pay the increased price, because there is no substitute for energy of the right type. If the manufacturer or service provider tries to pass these higher costs on to its customers, there is likely to be a cutback in demand, leading to a need for layoffs. Alternatively, with longer lead time, the company may be able to find a way around the problem of increased costs, by using more automation, or by outsourcing production to a country where costs are cheaper. Any of these responses leads to reduced US employment and recessionary impacts. Until fossil fuels came into widespread use, civilizations regularly grew until they reached limits of some sort, and then collapsed. There are many books looking at this issue. David Montgomery, in Dirt: The Erosion of Civilizations talks about the role soil erosion and soil degradation play in bringing civilizations down. Sing Chew, in The Recurring Dark Ages, talks about how ecological stress, deforestation, and climate change have led to long periods of collapse and low economic activity. Joseph Tainter, in The Collapse of Complex Societies, talks about how increasingly complex solutions to the problems of the day lead to ever-higher administrative costs that eventually become too expensive to afford. Peter Turchin and Surgey Nefedov in the book Secular Cycles take more of an analytical approach. They look at how cycles actually played out, based on financial and other detailed records of the day. Their analysis considered eight economies, the earliest of which began in 350 B. C. E.. The pattern they found looks disturbingly like the pattern that the world has been going through since the widespread use of fossil fuels began about 1800: A civilization starts its existence when a new resource becomes available, for example by deforesting land to be used for agriculture (or in our case, finding ways fossil fuels could be used). A civilization experiences Growth for 100+ years as the population is able to grow with the new resource available to it. Eventually the civilization reaches a Stagflation period. This happens when the civilization starts reaching limits. Population is much higher, the size of the governing class is much larger, and feedbacks like erosion and soil depletion start to play a role. In my view, Stagflation period began for the United States around 1970, when US oil production began to fall. Eventually, after 50 or 60 years, a Crisis Phase begins, when it is no longer possible to raise taxes enough to cover all of the governmental costs. In this period, wages of commoners drop to such a low level that nutrition declines, leading to epidemics and a higher death rate. Commoners often revolt, leading to government collapses. Wars for resources are sometimes fought. The Crisis Phase lasts a variable length of time, typically 20 to 50 years, with the length of time seeming to be shorter in the more recent cycles analyzed. There is considerable die-off from illness and warfare in the Crisis Phase. It seems to me that the United States, most of Europe, and Japan are now very close to the point where they will enter the Crisis Phase of a similar cycle. 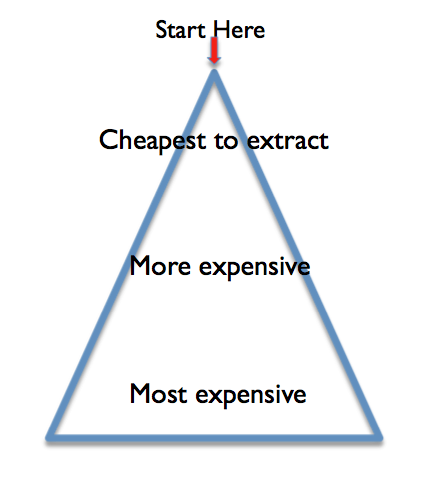 At the beginning of this post, I mentioned that rising investment costs lead to what I call an investment sinkhole problem, as we extract fuels and ores that require increasingly expensive inputs near the bottom of Figure 1. An examples might be tight oil, that is extracted using “fracking”. While we hear much about the hoped-for higher supply, we don’t hear that the newer types of oil are available only because oil prices are high. They can’t be expected to bring oil prices down. An investment sinkhole means that our dollar of investment doesn’t go as far; it is precisely the opposite of increased productivity. When we were still far from reaching resource limits, efficiency improvements could more than make up for the loss of efficiency that comes from the Investment Sinkhole effect. But as we get closer to limits, the situation is reversed. Efficiency improvements are outweighed by the ratcheting up of extraction costs, because of the Investment Sinkhole effect. This means that instead of increased wealth being added to the system by efficiency improvements over time, we find the Sinkhole effect predominates. The common worker needs to spend an increasing proportion of his paycheck on necessities, leaving less for discretionary items. The result is recession, or very slow economic growth. When the Investment Sinkhole problem starts to predominate, financial models suddenly don’t work very. Central banks react by cutting interest rates, in an attempt to stimulate economic growth. They also try to stimulate the economy by Quantitative Easing. This adds more money to the economy, and attempts to reduce longer-term interest rates. Of course, if the problem is really structural, there is no bounce-back to economic growth. The temporary fix becomes a bridge to nowhere. In the previous section, we talked about our immediate problems. But what about our longer-term problems? Figure 2. 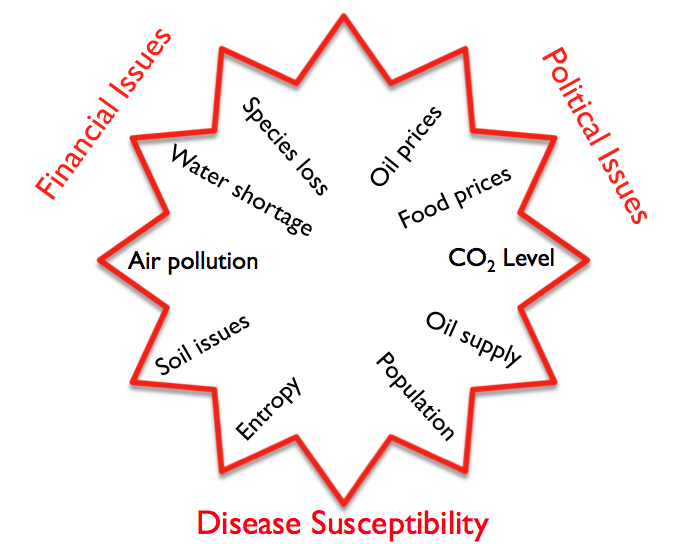 Author’s view of how various limits might work together to produce different symptoms, of the type seen by Turchin and Nefedov. Today’s financial system is based on the assumption that individuals and businesses can make and keep financial promises. This system worked well, when resource prices were flat or declining, as was the case prior to 2000. It was possible for businesses and governments to take out loans under the expectation of continued prosperity, and for individuals to buy houses and cars under the expectation that they would continue to have jobs, so that they could continue to make auto loan or mortgage payments. The situation changes dramatically, if the long-term expectation is for oil prices and other commodity prices to keep ratcheting upward. We don’t really have substitutes for oil and other commodities, so if we want to keep obtaining them, we need to pay the ever-higher cost. Even devices such as more efficient cars are affected by higher prices, because they too, use fossil fuels in their construction, and depend on ever more expensive technology. In a period when commodity prices are ratcheting upward, businesses find it increasingly difficult to forecast whether new facilities will continue to be economic 10, 20 or 40 years. Businesses find that customers gradually have less discretionary income, instead of more, so it becomes increasingly difficult for these customers to afford the products which are being sold. This makes business planning much more difficult. If a bank makes a long-term loan, it needs to include a much larger provision for the expected cost of loan write-offs. These higher loan write-off provisions causes interest rates to rise, making long-term loans unaffordable for many (or most) people and businesses. Governments are hugely affected as well. Without access to cheap loans, and with resource prices (especially oil, but sometimes desalinated water instead of well water, and natural gas) ratcheting upward, business failures rise. This leads to more layoffs, and more defaults on mortgages and auto loans. Interest rates on these can be expected to rise as well. All of these effects mean that debt-financing becomes much less attractive. Debt defaults, such we have just seen in Cyprus and Greece, become more common. This is not a temporary passing phase; it is a permanent long-term situation, caused by the ratcheting up of oil and other commodity prices, as resource extraction becomes more expensive. In such an environment, the amount of goods and services available tends to decline over time. Continued economic growth changes to continued economic contraction. If governments issue fiat money, it declines in value over time as well. (Money is sometimes defined as a “store of value,” but this becomes less possible.) One way this decline could occur is if those holding money have an expectation for continued inflation. Alternatively, money can be subject to an automatic downward adjustment that reduces its value on a monthly or annual basis. With such a system, individuals discover that if they have money, the best strategy is to spend it immediately, rather than to try to save for retirement or some distant goal. Investments in stock markets, or in stocks of new companies, are likely to decline. Without the availability of debt at a reasonable cost, businesses find it much more difficult to expand or to begin from scratch. New businesses tend to be small ones, that can finance their own operations by bootstrapping–that is, self-financing by using the profits on early sales to pay for materials needed for later sales, and hopefully for a little expansion as well. All of these issues mean that if there is a financial collapse, picking ourselves up afterward will be quite difficult. Our current financial system would need substantial modification to work in such a system. The size of the current financial sector would likely shrink dramatically. If the various countries of the world set up different financial systems to deal with the new realities, connecting them into a world system is likely to be difficult. Political stability is likely to be lower in a system such as this. How does one arrange long-term contracts, when there is a very real possibility that the government of the country that is party to an agreement may have collapsed, prior to the end of the contract? What Brings the Whole System Down? It is easy to think of a long list of things that might bring the system down. In fact, there are so many contenders that if any one of them starts the collapse, it seems likely others will push it on its way. Clearly one of the issues is the wide gap between US Federal Government revenue and government expenditures. Figure 3. 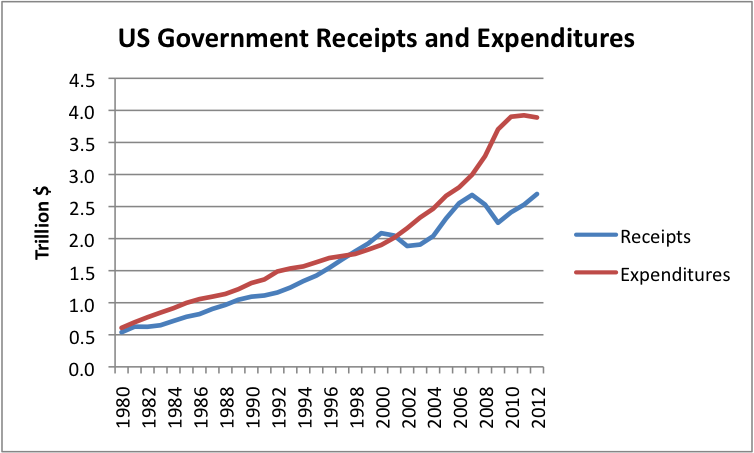 US Federal Government Receipts and Expenditures (including Social Security, etc.) based on Table 3.2 of the US Bureau of Economic Analysis. If the US government (or the government of any of the many countries who are having difficulty balancing their budgets) tries to raise taxes or cut benefits, to get revenue and expense back in line, the outcome is likely to be more recession and more layoffs. Debt defaults are likely to rise, putting banks into financial difficulty. There will then be a need for more bank bailouts, and a rerun of the problems we saw in 2008, but with governments in poorer financial condition to solve these problems. Another possible way the system could be brought down is by rising interest rates for governments, perhaps because of all of the failures elsewhere around the globe. Rising interest rates will mean that a government’s budget is even more unbalanced than it was before, because the higher interest rates translate to higher government expenses. These higher government interest rates would quickly be reflected in other interest rates, such as mortgage interest rates and interest on corporate loans. Sale of homes would drop dramatically, as interest rates rise. Prices of homes would likely drop as well. Business investment would drop dramatically. Much of the “stimulus” that the government has put in place would disappear. We likely would be headed back into major recession. A third possibility relates to the Quantitative Easing that has been done recently, and the artificially low interest rates that have resulted, even for longer-term loans. Investors who have to contend with these low interest rates will try to find ways around them, and in the process, create bubbles in asset prices. These bubbles invariably burst, with bad outcomes. For example, the WSJ recently published an article titled, “Investors pile into housing, this time as landlords.” Of course, when something goes wrong (like mis-estimating returns, or oil prices rising higher, leading to more pressure on renters’ ability to pay), the same investors are likely to pile right back out, puncturing the new bubble. Commercial investors rushing out will pull down property values, leading to yet more mortgage defaults as homeowners again find their loans “underwater”. A fourth possibility is that oil prices will ratchet upward again. Alternatively, natural gas may rise from its current artificially low price level in the US, to more like European or Japanese levels. Either of these would lead to more financial pressures on citizens, and more debt defaults. Banks would likely again be in difficulty, needing bail outs. A fifth possibility is that the Euro ceases to be a currency. Alternatively, some of the debtor nations could drop out of the Euro, allowing the Euro to rise for remaining nations, thus putting the remaining nations in a worse position for selling their exports. In either of these scenarios, the European crisis could be exported to the US, partly as reduced demand for our goods, and partly through exposure of banks to European defaults. A sixth possibility is the effects of ObamaCare will destabilize an already weak economy, as businesses attempt to circumvent its effects by substituting more part-time workers for full-time workers. A seventh possibility is that pensions start running into real financial difficulty, because of artificially low interest rates. The US government may be called in to bail out pension funds, or the Pension Benefit Guaranty Corporation, at high cost. An eighth possibility is that states start leaving the United States, because they feel that they would be better off on their own, as taxes and mandatory programs (such as ObamaCare) become increasingly difficult to deal with. What does the shape of the decline look like? Many people who base their views on geological depletion of oil expect that the decline will be somewhat slow, matching geological decline. I don’t think geological decline rates will have much to do with the shape of the decline, except for perhaps setting an upper bound as to how well things might, in theory, work out. The big question in my mind is how well the international financial system will hold together. There is a close corollary question: How successful will be at replacing it on a timely basis if it does fall apart? My concern is that if banks are suddenly closed, businesses of all types will fail. This could include companies extracting oil as well as companies selling electric power and companies providing fresh water. If there are long-term problems with the financial system, international trade is likely to be greatly reduced. Businesses making trades are likely to want greater assurances that they will actually be paid than is the case today. This could take the form of bilateral trade with trusted partners, or “I’ll ship you Product A if you will ship me Product B,” as a form of barter. A slowdown in world trade could have dramatic repercussions quickly with respect to our ability to keep basic services in good repair, because we are now dependent on international trade for replacement parts of products we use every day (such as cars and trucks). Nearly everything that is manufactured today incorporates raw materials from around the world, and uses machines that depend on parts from around the world. Another question is whether there will be huge political disruptions. If banks are closed, someone usually is blamed. We have seen many ways these political disruptions can take place. Some examples might include Syria, Egypt, the Former Soviet Union, and Greece. One scenario I can imagine is that some parts of a country are subject to more disruption than others. In one part of the country, banks may be closed, while in another part, states may be able to reopen closed banks. Or electricity outages may occur following a storm, and never be repaired, while other locations nearby are doing fairly well. There may be political riots, but these are often located in areas where politicians are located, not in other areas. Perhaps it is just as well that we don’t know exactly what the decline will look like. Not knowing gives us some chance for optimism. This entry was posted in Financial Implications, Planning for the Future and tagged collapse, financial collapse, fossil fuels, high oil prices, peak oil, resource limits. Bookmark the permalink.